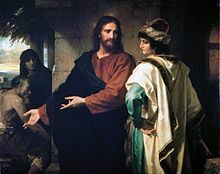 Jesus and the rich young man is an episode in the life of Jesus in the New Testament. The difference between ourselves and the rich young man is that he was not allowed to solace his regrets by saying: "Never mind what Jesus says, I can still hold on to my riches, but in a spirit of inner detachment. Despite my inadequacy I can take comfort in the thought that God has forgiven me my sins and can have fellowship with Christ in faith." But no, he went away sorrowful. Because he would not obey, he could not believe. In this the young man was quite honest. He went away from Jesus and indeed this honesty had more promise than any apparent communion with Jesus based on disobedience.